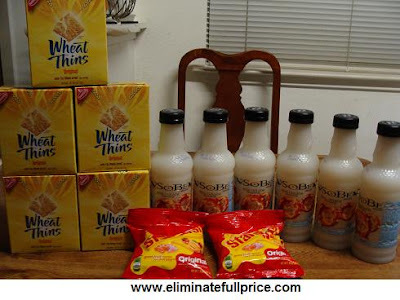 Eliminate Full Price: Thrifty Tuesday @ CVS - All I spent was $0.30! My $0.30 Thrifty Tuesday trip to CVS was made possible by a transaction I did this past Sunday. At CVS this week, Candy Corn and Alive! vitamins are free when used with Extra Care Bucks (ECB). I used my $0.99 ECB on the Candy Corn. Then I used $9.00 ECB and a $1.00 off Alive! 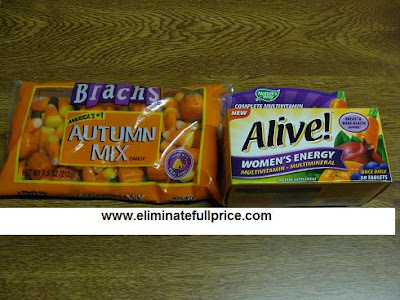 vitamins coupon from coupons.com which made them both free. After I did this transaction, a $5 off a $15 purchase coupon printed at the end of my receipt that's valid until 9/15/10. I wanted to use the $5 off a $15 purchase coupon before it expired so I went tonight and bought the following items for a total of $0.30! Here are the coupons I used to bring my total down to $0.30. -6 free bottle of Sobe coupons I won from Sobe's Heads or Tails Instant Win Game that's now over. $17.84 total - $17.54 coupon total = $0.30 is all I paid!